Despite plenty of news about returning sales at the automakers like GM, Ford, Chrysler-Fiat, Toyota, etc., the auto stock sector reflects much pessimism due to the global economy especially for 2012. Question is, what will turn the auto sector stocks around from their bearish bias? It doesn’t matter who or what you read, the news on the global economy is surely pressuring the auto stock sector. 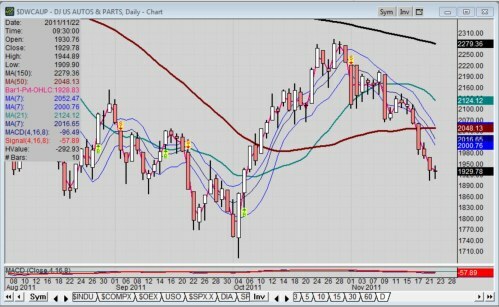 Look at any auto stock chart and the pattern will likely look similar to the $DWCAUP, the only index-like indicator that we have for automotive. It is called Dow Jones US Autos & Parts. One look at the $DWCAUP and you see a familiar price-dynamics pattern that reflects the sentiment of what you just read. First, there is a bottom in early October followed by a swing peak in late October. Furthermore, the 50-day moving average (red) is below the 150-day moving average (black). That’s technically bearish. Now you can check any auto stock you care to choose and the pattern will be similar, whether it’s General Motors Company (NYSE: GM), Ford Motor Company (NYSE: F) or Toyota Motor Company (ADR: TM). The only exception I could find is Tesla Motors (Nasdaq: TSLA). Every one of these auto stock charts are showing a bearish bias; meaning the risk is in buying, unless you have a very long-term horizon. For the record, GM closed today at 20.73, Ford closed at 10.09 and Toyota closed at 61.94 just above a new 52-week low of 61. Problem is, not everyone has the chutzpah to buy when stock prices are in a bear market; and I confess that I am one of them. That is why I like options for its potential but defined risk. Another point is, the $DWCAUP reflects the major automakers within a basket of everything automotive including parts at this time. So, it pays sometimes to view this chart in addition to just OEMs. And key is the fact that all, including part manufacturers, are still saying the same thing right now - downtrend bias. This will not last forever; it never does; and I think that’s what Graham’s book indicates. In this case, it might pay to at least watch individual automaker charts in light of the $DWCAUP. In other words, watch for any stock breaking away from the general trend, as that would be significant. We want to see a flattening or bottoming of prices. Of course, most charts are following the general market these days. If the Dow goes up, then auto stocks often go up, too., in unison; just not to the same degree. Wednesday, Nov. 23rd is the last trading day for this Thanksgiving Day week. Just be apprised that other markets around the globe will be open. So, that means - game is always on somewhere, if nowhere else than in the minds and hearts of traders and investors around the world. What the market will do next week is anyone’s guess. Some CNBC guests are actually asking if their will be a Santa Claus rally this year. For sure here are certainly plenty of opportunities for black swan events. Just know that those statements I quoted earlier are real ideas from real people. If they exist in someone’s head, there are likely others; and ideas affect sentiment. Question is, have we reached a level of sentiment whereby there is blood in the streets? Or is there more downside to go? Full Disclosure: At time of publication, Sherosky, creator of the auto sector charts for TN, is neither long or short with the mentioned stocks or futures, though positions can change at any time. None of the information in this article constitutes a recommendation, but an assessment or opinion.